Contact your local stores to inform them of your thoughts on this issue. Please remember that local business owners are valuable to our community: we don’t want to harass them we just want to make them aware of the issue and ask for their support. We are asking people to continue to communicate their concerns in a direct and respectful manner. If your local store will not support the boycott, perhaps they would be willing to help by carrying other, local Fire Ciders as well. 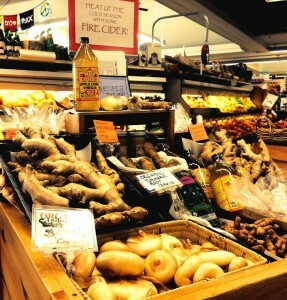 Or perhaps your local store will host a Make Your Own Fire Cider day! Check out the Resources page for more great downloadable materials – including Make Your Own Fire Cider posters and recipe cards for display! *There has been some confusion among herbalists regarding the term “Cease and Desist”. Letters that were sent to herbalists by Shire City Herbals were loosely referred to as “Cease and Desist” letters. Herbalists were not aware that this term requires an additional legal action that would need to be taken by Shire City Herbals. Any mention of “Cease and Desist” by herbalists made in the past is referring to the personal letters sent by Shire City Herbals asking them to cease the sales of Fire Cider. We are working to correct this technicality among the herbal community, on blogs and posts, and from here on we will refer to the above mentioned action as “cease sales” letters. However, the action the herbalists are referring to is still the same. Shire City Herbals is asking herbalists to cease sales of fire cider, with potential legal ramifications if they do not. Please reflect these technical changes in your boycott communications. Thank you! I am writing to talk to you about one of the brands you carry: Shire City Herbals Fire Cider. Fire Cider is a term that was invented by Rosemary Gladstar (an herbalist) over 35 years ago, and has been shared by her freely since. She originally coined the term within her pamphlets in the 1970s. She also sold Fire Cider in her herb shop in the 1980’s in California, and the term also appeared in her published and copyrighted books from the 1990s. As mentioned, her recipes as well as the term fire cider were freely shared by Rosemary, and so has become common and generic both inside and outside the herbalist community—as common as bloody mary is or chai latte. Since the term was invented, many companies have sold varying versions Fire Cider as a product on line, in stores and at farmers markets. In 2012, the Shire City Herbals corporation applied for and was granted a trademark for this term by the United State Patent and Trademark Office (USPTO). Since that granting, starting in 2014, Shire City Herbals began contacting small businesses as well as individuals that sell fire cider, asking them to remove the name from their product—people who have been making and selling fire cider for many years and in 2015, attorneys representing the Shire City Herbals corporation began sending ‘Cease and Desist’ letters to those same individuals and companies. The owners of Shire City Herbals have been approached directly by Rosemary Gladstar—as well as thousands of others via petitions—asking them to willingly recall the trademark; but they have refused to do so. Further still, in April of 2015, Shire City Herbals filed lawsuits against three fire cider producers for $100,000 in damages. In June of 2014, a group fire cider producers banded together and are now petitioning the USPTO to rescind the trademark. But this action may take years to resolve. The new lawsuit is Shire City Herbal’s latest response to this petition. For more information, please check out: http://freefirecider.com/faqs/. But as any good citizen should do, I also directly contacted the Shire City Herbals owners. I would like you to consider supporting a boycott by removing the Fire Cider product made by Shire City Herbals from your shelves—until this matter is resolved. Currently, there is an active group of over 12,000 people that are petitioning the United States Patent and Trademark Office to revoke the trademark. Within the first twenty-four hours, 2,000 signatures were added to the petition. Clearly, this is an important issue to many. The Following Stores Have Confirmed That they are Standing with the “Free” Fire Cider Movement”.